We are now half way through our sermon series for Lent which looks at different aspects of the cross. I wonder how your understanding of what Jesus did for us on the cross has deepened? I wonder how you have been challenged to respond? Do share your insights with others so that we can all benefit from them! The Lent lunches on Wednesdays are a great opportunity for this. Why not come along? Everyone is very welcome to join us in the Parish Room for soup, conversation and a short reflection. If you would like to explore this vital topic in more depth, I would like to recommend two books you might find helpful. Jane Williams has written an excellent little book (it really is little…fewer than 50 pages!) called ‘Why did Jesus have to die?’. It is part of the ‘Little Book of Guidance’ series and clearly lays out some of the things we need to include if we are to answer this key question. The other is the book that the Preachers and Leaders are reading this term: ‘God with us The meaning of the cross and resurrection. Then and now.’ by Rowan Williams. Although Rowan Williams can sometimes be hard-going, do not be put off. This short book is based on some talks he gave; it is very readable, clear and thought-provoking. I have also drawn on this book for my sermons and am looking forward to reading it more thoughtfully during Holy Week. 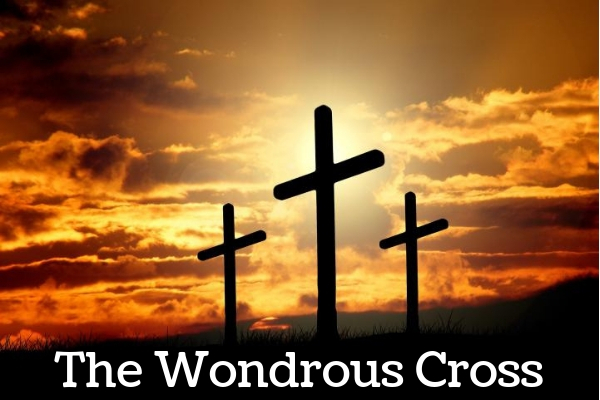 If you would like to talk about anything God is saying to you through this series or about ‘The Wondrous Cross’, please do contact me and I would be delighted to chat with you.